Acknowledged author Judith Goodenough wrote Biology of Humans: Concepts, Applications, and Issues comprising 608 pages back in 2016. Textbook and etextbook are published under ISBN 0134045440 and 9780134045443. 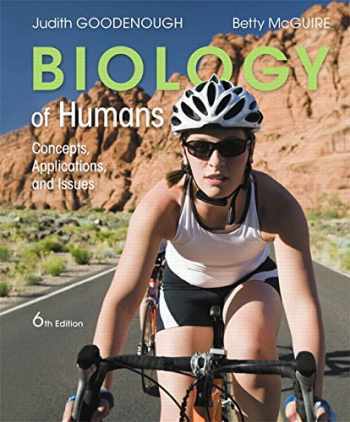 Since then Biology of Humans: Concepts, Applications, and Issues textbook received total rating of 3.5 stars and was available to sell back to BooksRun online for the top buyback price of $52.87 or rent at the marketplace. For courses in non-majors biology. Helps students learn the concepts and applications of human biology using relevant topics and realistic scenarios Known for its unique “Special Topic” chapters and emphasis on everyday health concerns, the 6th Edition of Biology of Humans: Concepts, Applications, and Issues continues to personalize the study of human biology using a conversational writing style, vibrant, easy-to-follow illustrations, abundant applications, and a new emphasis on using everyday science literacy skills. The authors provide a practical, friendly introduction to the study of the human body, preparing readers to navigate today’s rapidly expanding and shifting world of health information. Each chapter now features brand-new “Consider This Case” exercises and “Finding and Evaluating Information” activities that challenge readers to think critically and apply their knowledge to solve real-world cases. Along with scientific updates and content improvements throughout the text, the 6th Edition also includes a new “Special Topic” chapter on the Obesity Epidemic. Note: You are purchasing a standalone product; Mastering Biology does not come packaged with this content. Students, if interested in purchasing this title with Mastering Biology, ask your instructor for the correct package ISBN and Course ID. Instructors, contact your Pearson representative for more information. If you would like to purchase both the physical text and Mastering Biology, search for: 0134056671 / 9780134056678 Biology of Humans: Concepts, Applications, and Issues Plus Mastering Biology with eText -- Access Card Package, 6/e Package consists of: 0134045440 / 9780134045443 Biology of Humans: Concepts, Applications, and Issues, 6/e 0134254910 / 9780134254913 Mastering Biology with Pearson eText -- ValuePack Access Card -- for Biology of Humans: Concepts, Applications, and Issues, 6/e Biology of Humans: Concepts, Applications, and Issues , 6th Edition is also available via Pearson eText, a simple-to-use, mobile, personalized reading experience that lets instructors connect with and motivate students – right in their eTextbook. Learn more.